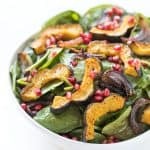 Paleo + Whole30 Roasted Acorn Squash Spinach Salad Recipe – dressed in a balsamic vinaigrette and topped with pomegranates and roasted onions. 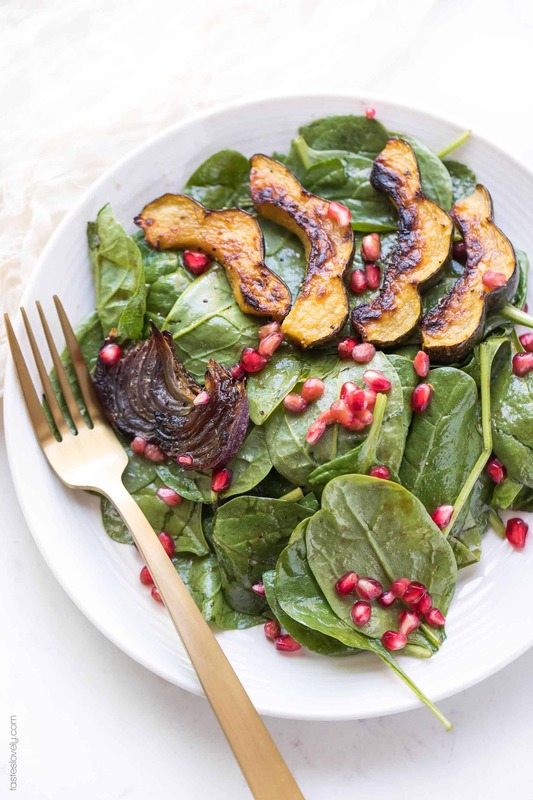 Delicious, healthy and perfect for Fall and Thanksgiving! Gluten free, grain free, vegan, dairy free, refined sugar free, soy free, clean eating, healthy living, real food. 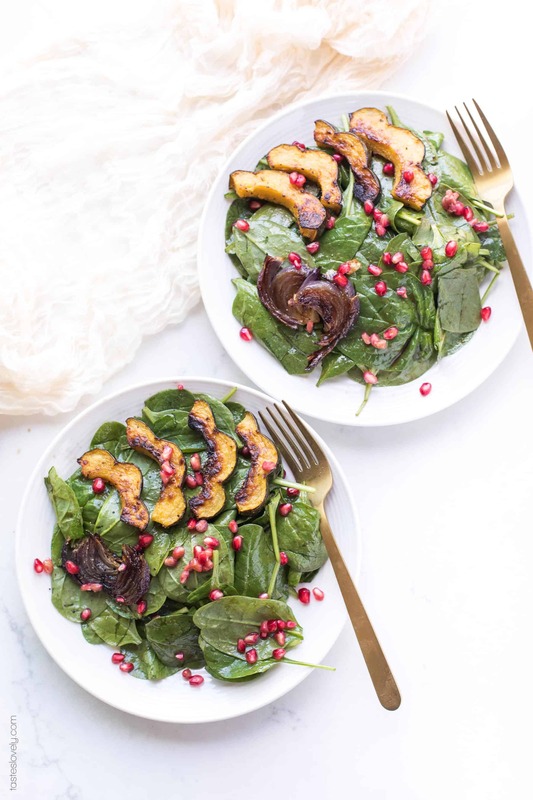 This is the most perfect salad for Fall. All of my favorite ingredients. Roasted acorn squash. Roasted onions. Baby spinach leaves. Pomegranates. All dressed in my favorite balsamic salad dressing. I’ve recently become a huge fan of acorn squash. You don’t have to peel it, which makes it much easier to prepare than butternut squash. The skin of the acorn squash gets a little crispy as it roasts. 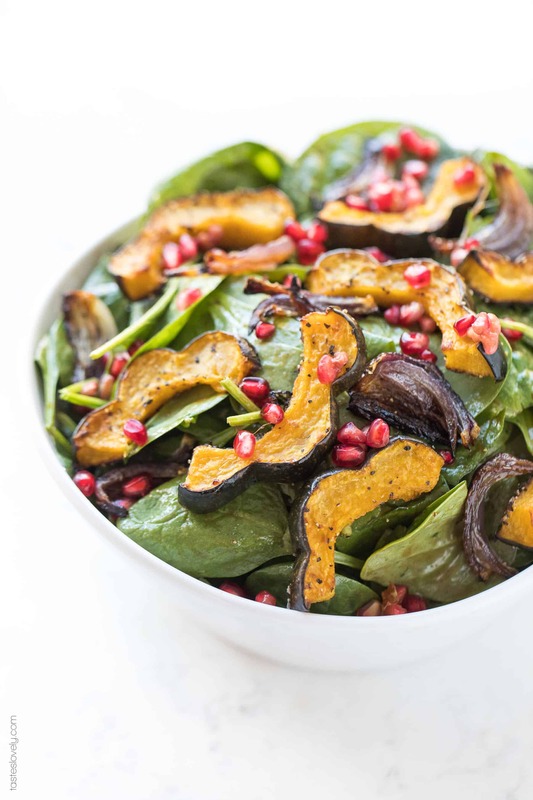 The earthy roasted acorn squash pairs perfectly with the sweet roasted onions. 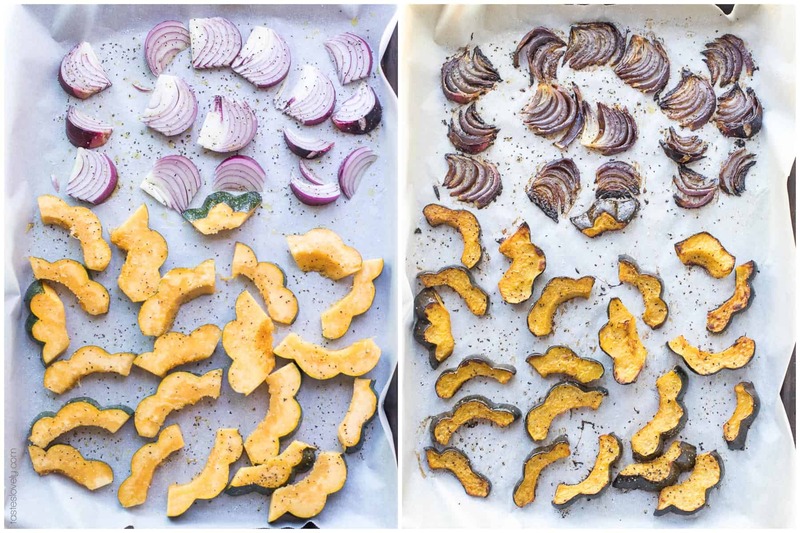 I throw them both on a baking sheet, drizzle with olive oil, and let the oven do all the work for me. Ad the vegetables are cooling, I prepare the spinach leaves, whisk together the salad dressing, and deseed the pomegranate. Or you can save even more time and buy pomegranate seeds from Whole Foods. Great time saver tip: if you’re going to be preparing this salad for guests, say for Thanksgiving (this one is so perfect for Thanksgiving! ), you can roast the acorn squash and onions up to 3 days in advance. Then, on the day of, just add them on top of the salad cold. Or you can serve it as a main course salad. I’ll just add on some cooked chicken breasts on top to make it a more filling, hearty salad. This is a salad that everyone can love. It’s healthy, and fits with just about every diet. Paleo, whole30, vegan, dairy free, gluten free, grain free, refined sugar free, soy free, clean eating, healthy living, real food. Preheat your oven to 425ºF. Line a rimmed baking sheet with parchment paper or foil for easy cleanup. Arrange the acorn squash and onions in a single layer (no overlapping). Drizzle with olive oil, salt and pepper. Roast for 35-45 minutes, until golden brown and easily pierced with a fork. Remove from the oven and allow to cool to room temperature for 5-10 minutes. In a large salad bowl, toss the spinach with the salad dressing. 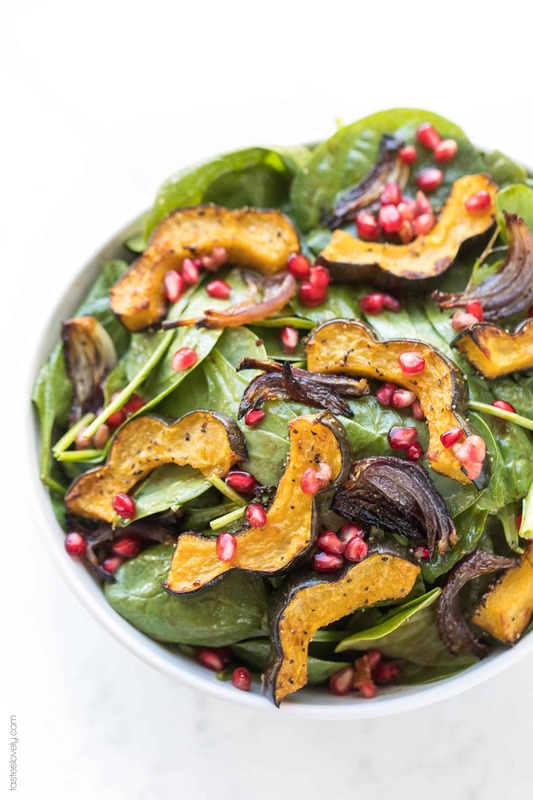 Top with the cooled roasted acorn squash, onions and pomegranate seeds. Hope you love it when you make it! Thanks Cheryl!